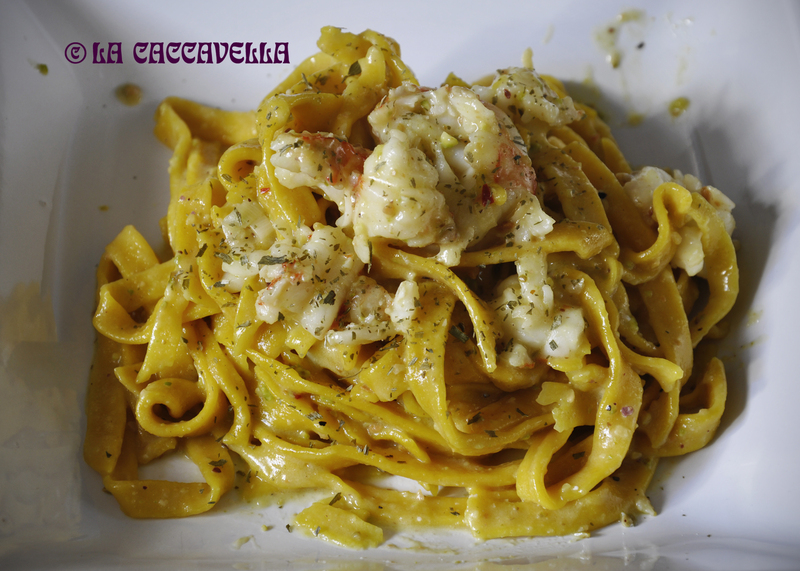 Tagliatelle alla curcuma con gamberi e pesto di pistacchio [Turmeric noodles with shrimp and pistachio pesto] – Alto Adige Pinot Bianco. Vi giriamo la seconda ricetta della nostra blogmate Mariuccia (www.lacaccavella.wordpress.com), noi di vinopolis.co vi consigliamo di abbinarci un Alto Adige Pinot Bianco. Solitamente non preparo pasta all’uovo, mi piace usare semplicemente farina di grano duro, farina integrale e acqua calda. Questa volta ho voluto arricchirle con la curcuma. Oltre ad avere fantastiche proprietà e un profumo molto particolare, dona alla pasta un bellissimo colore giallo. Mescolare la farina con la curcuma e il pizzico di sale. Versare lentamente l’acqua calda e impastare delicatamente con le mani. Regolarsi con l’acqua, l’impasto deve rimanere abbastanza sodo. Stendere con il mattarello oppure con la macchina per la pasta, una sfoglia non troppo sottile.Tagliare le tagliatelle e lasciarle ad asciugare. Conviene prepararle la mattina o la sera prima. Nel frattempo preparare il pesto. 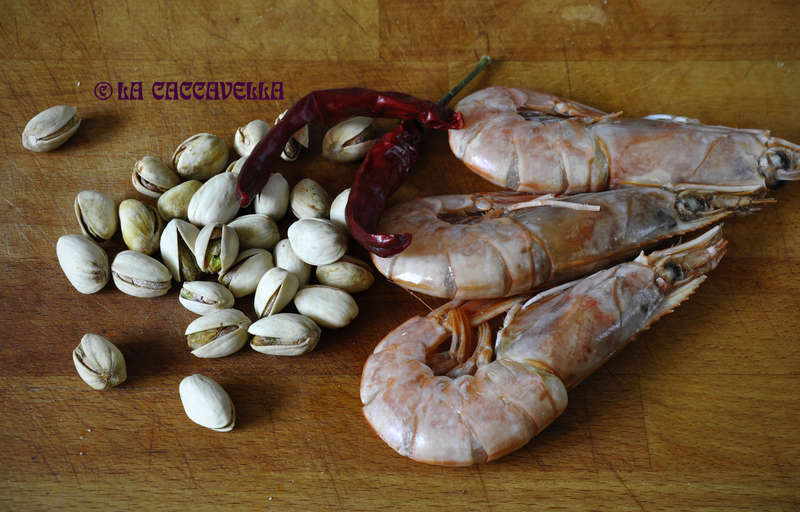 Sbucciare i pistacchi e frullarli nel mixer insieme agli altri ingredienti.Pulire i gamberi e rosolarli in olio, con lo scalogno e il peperoncino, sfumandoli con un po di vino bianco, se lo gradite. Scolare le tagliatelle lasciando un po d’acqua di cottura. Saltare il tutto con il pesto e i gamberi. Serire con una spolverata di prezzemolo fresco tritato. Buona appetito! Usually I don’t prepare pasta with eggs, I like to use just whole wheat flour and warm water. This time I wanted to enrich them with turmeric. 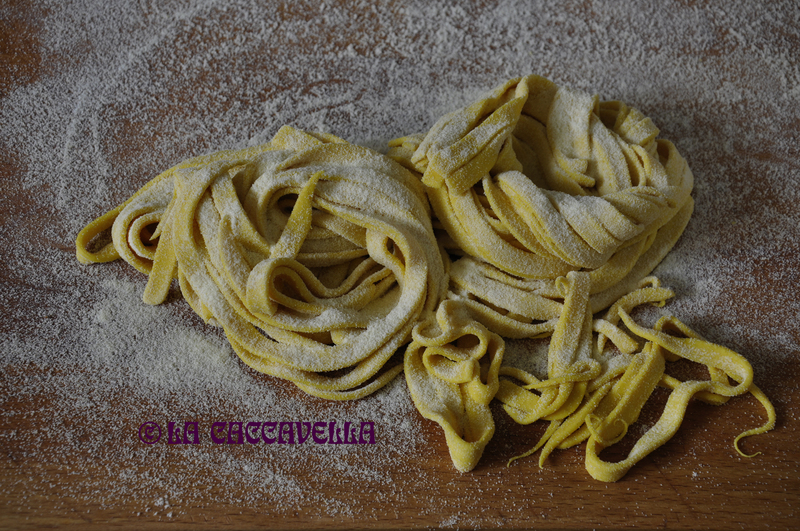 In addition to having fantastic properties and a very particular smell, gives the pasta a beautiful yellow color. I wanted to dress them with the shrimp and I thought of a sauce to enrich them. I tried with pistachios, I think it’s a good match. Mix the flour with turmeric and salt. Slowly pour the hot water and mix gently with your hands. Adjust with water, the mixture should be quite hard. Roll out with a rolling-pin or with a pasta machine, the dough is not too thin. Cut the noodles and leave to dry. It should prepare them in the morning or the night before. Meanwhile, prepare the pesto. Peel the pistachios and blend in a food processor with the other ingredients. Clean the shrimp and sauté in olive oil with shallots and chilli, with a bit of white wine, if you like it.